Guinea Bissau is a country in West Africa. It is bordered by Senegal to the north and Guinea to the south and east, with the Atlantic Ocean to its west. Guinea-Bissau, has a swampy coast, with forests changing to grasslands in the east. The country has mostly low-lying coastal plain with a deeply indented estuarine coastline rising to savanna in east; numerous off-shore islands including the Arquipelago Dos Bijagos consisting of 18 main islands and many small islets. Once hailed as a potential model for African development, Guinea-Bissau is now one of the poorest countries in the world. Guinea–Bissau’s economic freedom score is 51.3, making its economy the 143rd freest in the 2014 Index. Bissau is an impressive rural metropolis where many of the upscale villas are built according to Mediterranean architecture. The colonial-design civilization is located near the spectacular beaches of the country. One of the most interesting locations within the city is the cultural center called Pidjiguiti. If eco-tourism is the game, then the famous national parks remain as the top tourist attractions in Guinea-Bissau. The Archipel de Bolama, located near the ancient ruin complex, is designated as one of the UNESCO MAB Biosphere Reserves. The Museum of Artefacts is one of the top tourist attractions in Guinea-Bissau and a perfect place for scholarly travellers to visit. This is one of the ideal places to get an intimate glimpse of the country’s history. But the genuine works of art displayed in this museum shows a more humanist side of this West African nation – something that goes beyond the parameters of academic knowledge. Items like traditional pottery, weaving, sculpture and basket-ware comprises the artistic talent of the craftsmen in the ancient Kingdom of Gabu. The Bolama Bubaque is the region in Guinea-Bissau that features the more intimate glimpse of the country’s ancient past. No stronger evidence of a nation’s ancient culture is more compelling than its ruins. The ancient architectural debris of Bolama Bubaque is a sacred place that ideally resisted colonial power up until this day. It is located within a picturesque natural terrain of the country. It is quite unfortunate that this site lacks accommodations, but it remains an ideal camping site for a more rugged type of curious tourists. lha de Orango is one of the many islands that form the Orango Islands National Park. It is a great place to island-hop and enjoy different beaches while taking in the beautiful nature that surrounds the palm-fringed coasts. The landscapes are comprised of splendid woodlands and swamps inhabited by rare species of saltwater hippos and crocodiles which are perfect for bird watching and turtle sighting. Capital City: Bissau is the capital city of Guinea-Bissau. In 2007 Bissau had an estimated population of 407,424. 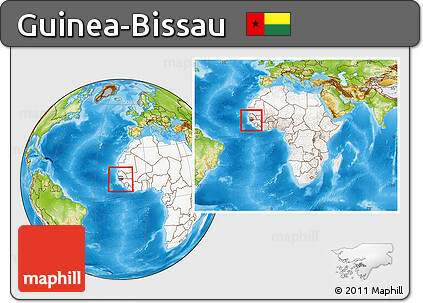 Bissau is located on the Geba River estuary, off the Atlantic Ocean, and is Guinea-Bissau’s largest city, major port, and its administrative and military centre. Religion: Religion in Guinea-Bissau. Throughout the 20th century, most Bissau-Guineans practiced some form of Animism. Recently, many have adopted Islam, which is currently practiced by 50% of the country’s population; most of Guinea-Bissau’s Muslims have Malikite Sunni denomination, with Shia and Ahmadiyya minorities.